The County of Bruce has received a $285,000 grant from the Government of Ontario, to help advance establishing a Trades and Skilled Workforce Secretariat and Energy Business Incubator, as part of the Nuclear Innovation Institute (NII). Bruce County’s successful application to the Ontario Labour Market Partnerships (OLMP) program signals a strong interest from the Ontario Government to support advancements that focus on a collaborative approach to increase the supply of skilled trades in Ontario. The funding also supports the completion and adoption of “Project Innovate: Driving Innovation in Bruce County,” and “The Bruce Centre of Excellence Business Plan.” Building on the success of Project Innovate, The Bruce Centre of Excellence Business Plan, is five-chapter playbook, that lays out the Who, What, When, Where, Why and How we develop and integrate a Trades and Skilled Workforce Secretariat and Energy Business Incubator into the NII. “The County of Bruce is thrilled the Ontario Government is contributing to this project, helping advance Bruce County’s interests within the Nuclear Innovation Institute,” says Mitch Twolan, Warden, Bruce County. “We are equally excited to spearhead new innovative programming and partnerships that will bring workers, employers, entrepreneurs, educators and students together, here in Bruce County,” he adds. The Regional Skilled Trades Advancement Forum hosted last Friday, enables the Nuclear Innovation Institute, under the leadership of Bruce County and Bruce Power, to launch the Trades and Skilled Workforce Secretariat (formerly referred to as the Skilled Trades Secretariat) while also introducing Pierre Valley, the Secretariat’s new Talent Development Officer to our industry and regional partners. The Talent Development Officer is a jointly funded position between Bruce County and Bruce Power; serving as a key resource to facilitate opportunities for the Trades and Skilled Workforce Secretariat. Pierre will be housed in the County of Bruce on a temporary basis until the NII ramps up. 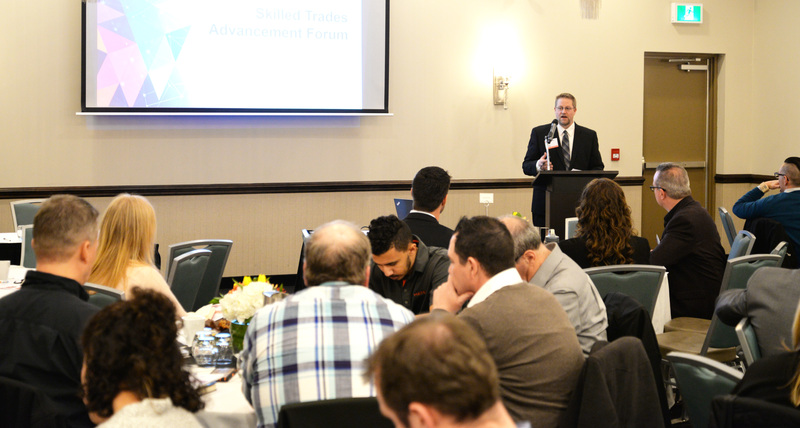 Pierre will begin his new role by taking feedback received at last week’s Forum and develop a Skilled Trades Advancement Strategy for the region. The Talent Development Officer is funded in part by the Government of Canada and the Government of Ontario. In May 2018, Bruce Power and the County of Bruce announced a new partnership to establish Ontario’s Nuclear Innovation Institute (NII) in Bruce County. The NII will bring together technological leaders to share collective expertise and knowledge, while identifying opportunities to advance nuclear applications and technologies, as well as people skills through training. One of the three key functions for the NII is a Trades and Skilled Workforce Secretariat. The Trades and Skilled Workforce Secretariat, consists of industry leaders coordinating and increasing employment in the skilled trades in support of building a strong, sustainable regional labour force. Centered on partnerships with education, labour unions and the government, the Secretariat works to collaboratively address regional and sectoral needs in the labour market and increase participation in underrepresented groups.